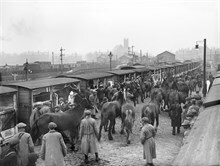 The War Horse Route mostly follows that taken by thousands of horses brought from all over the world to Ormskirk Station via Liverpool Docks. 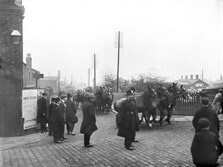 The horses were then walked through the streets of Ormskirk to Lathom and the Remount Depot at Lathom Park where they were then trained for service. Horses and mules were a vital part of the war effort and Lathom Park hosted over 200,000 before they carried out their service, sometimes at the war front in France. Lathom Park was one of only three Remount Depots in the UK. Later in the war, horses were transported by rail direct to Lathom Park. One of the stories of a war horse called Joey was told by Michael Morpurgo in his book “War Horse” and by Steven Spielberg in his film of the same name. The circular route is 8.5 miles long, it goes out to Lathom Chapel and returns via cross field paths with some stiles and footbridges.